You might recall my posts from a few months ago – Branding Secrets of the World’s Best Brands and What Can You Learn From The World’s Best Brands – about the lessons that startups and small businesses can learn from the world’s best brands. Today, one of the most important strengths of a brand is its social currency, the extent to which people share the brand or information about the brand with others as part of their everyday social lives. Why is social currency important to brands and why should small businesses and startups care about this importance? Having social currency increases a brand’s engagement with consumers and interaction with customers. It grants access to information and knowledge, it helps companies to create unique brand identities, and it develops permission to interact with consumers or customers. In today’s age, building social currency is probably the most important investment companies can make to create value for themselves. Consumers and customers will benefit as well as they increasingly participate in social platforms, and use social technologies. The impact of social currency isn’t trivial. 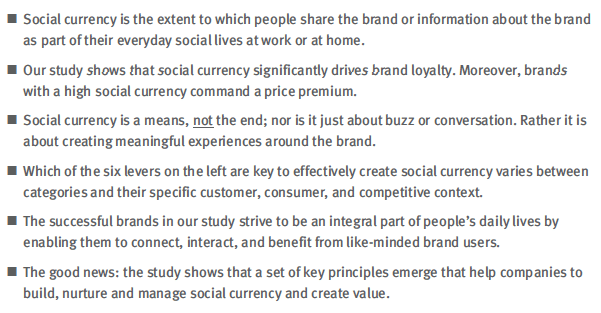 The study found that across categories and brands, 53% of consumer brand loyalty can be explained by social currency and that brands with high social currency can command price premiums over their competitors. Not surprisingly, BMW is ranked as number one brand in the auto industry (and also number one overall brand) based on social currency. I encourage you to download for free and read the full PDF copy of this study. How do you feel about social currency? Do you agree that social currency is more than just buzz and community?